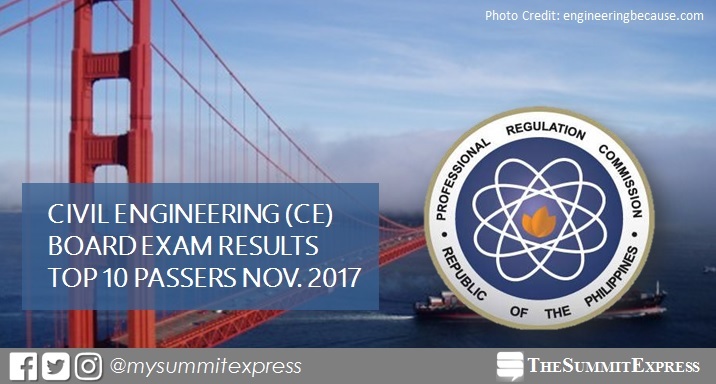 MANILA, Philippines - The full list of topnotchers or top 10 passers for November 2017 Civil Engineer (CE) board exam is available on this page as officially released on Tuesday, November 21, 2017 or in four (4) working days after the last day of examinations. Nikho Lawrence Ramos Corres from the University of the Philippines (UP) - Diliman aced the board with 97.90%. It was followed by Hans Lawrence Eugenio dela Cruz of Technological Institute of the Philippines (TIP) - Manila garnering 97.55%. The Professional Regulation Commission (PRC) conducted the Civil Engineering licensure exam in the cities of Manila, Baguio, Cagayan de Oro, Cebu, Davao, Iloilo, Legaspi, Lucena, Tacloban, Tuguegarao and Zamboanga on November 11 and 12, 2017. In the November 2016 exams, Sirven Carandang Garibay from the University of the Philippines (UP) - Los Baños topped the board with 93.20%. It was followed by University of San Carlos (USC) alum Samuel Eliezer Yu Uy with 92.75%. Meanwhile, Cebu Institute of Technology (CIT) alum Armand Henzkel Bangolan Canoy aced the board with 94.80% in the November 2015 exams. Rayniel Joseph Martin Salonga from Polytechnic University of the Philippines (PUP) - Sta. Mesa placed second with 94.75%. Government work (including PRC Manila) was cancelled on November 13 to 15 due to the Philippine hosting of ASEAN Summit and Related Meetings. Monitor this page for the real-time updates on CE board exam results. Check out also the official website of PRC for more information.